Usually, I steer clear of modern bands and releases, with very few exceptions. 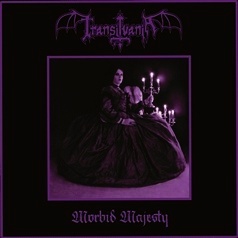 However, an acquaintance recently brought to my attention the Austrian Black Metal band, Transilvania. It was said that their September 2015 demo tape, Morbid Majesty, would be right up my alley. Recommendations are often tricky, as I am often a bit too selective, but the old school vibe lured me in, right from the start. Musically, this could best be described as Black/Thrash, in the vein of old Desaster. Even the vocals are very reminiscent Okkulto's performance on A Touch of Medieval Darkness. The musicianship is rather sloppy, but that actually benefits this style and adds to the raw feeling. Fortunately, the production is gritty and unprofessional, which is exactly what is needed for this sort of music. One of the biggest mistakes made by a lot of 'retro' bands is that they play a bit too tight and have a sterile, modern sound to their albums, thus ruining the whole thing. "On the Back of Satan's Stallion" and "One Night in Salem" include some pure Black Metal riffs, but these are brief and soon give way to Teutonic-inspired Thrash, which dominates most of the recording. The majority of the riffs are purely '80s-inspired and, along with several of the solos, hearken back to the middle of the decade. For the most part, the songs maintain an intense pace, but there are times when things relax just enough to let the riffs breathe a bit and to accentuate the dark atmosphere, such as in "Moonlight Sorcery". There are even moments that are a little more melodic, showing some old Mercyful Fate influence, perhaps. Rather than just utilizing harsh Black Metal vocals over traditional Thrash riffs, the members of Transilvania do well in composing songs that seamlessly transition from one style of riff to another to create an obscure and hellish feeling. Morbid Majesty is a great little demo, oozing the sort of old school vibe found on classic records from Destruction, Tormentor, Sabbat, etc. Hopefully, Transilvania will manage to record more material in the near future and, more importantly, maintain the same raw and evil feeling as found on their debut release.